In this time of fiscal crisis, we should always remember this saying “health is wealth”. It is very difficult to be sick nowadays. Hospitalization is very expensive. Even if you are confined in a government hospital, you have to spend for laboratory examinations, medicines and professional fees of the doctors. Healthy diets, regular exercise, abstinence from smoking and moderate alcohol intake are key components of a healthy life-style. With the changing lifestyle of Filipinos, chronic degenerative diseases such as diabetes, heart disease and cancer are be-coming significant public health problems Based on the 2003-2004 National Nutrition Health Survey (NNHeS) conducted by the Food and Nutrition Research Institute-Department of Science and Technology in collaboration with the Department of Health and 14 medical societies results revealed that 9 in every 10 Filipino adults have at least one risk factor to cardio vascular disease (CVD). The following risk factors listed from highest to lowest prevalence rate include, physical activity, smoking, hyper-tension, hypercholesterolemia, and diabetes. Smoking is the most prevalent risk factor of cardiovascular diseases including heart attack and stroke among Filipinos. This accounts for about 28,694 deaths in 2003 as reported by Dr. Antonio L. Dans, Chairman of the NNHeS Technical Committee. Inspite of the anti-smoking campaign, Filipinos are smoking more (34.8%) compared to Singaporeans (24.2%) and the Americans (24.1%). Android or apple-shape obesity, a common risk factor of chronic degenerative disease is another risk factor of hypertension. Android obesity has remained more prevalent among females (18.3%) than males (3.1%) using waist circumference. 1. Increase consumption of vegetables particularly the leafy and yellow vegetables like alugbati, saluyot, malunggay, kamote tops, kangkong or fresh sal-ads. 2. Eat at least 2-3 servings of fruits. They are rich sources of vitamin C, beta-carotene, and potassium. 3. Limit consumption of fatty foods especially those from animal sources. 4. Eat breakfast that is high in complex carbohydrates like oatmeal, root crops, whole grain cereals, and bread. 5. Avoid excessive intake of sugar and salt. 6. Exercise regularly. Perform aerobic exercise regularly for at least 3 to 5 times a week for 20-30 min-utes or more. Regular exercise burns off energy thereby assisting weight control or reduction. It also helps improve blood circulation, muscle tone and the efficiency of heart and lungs. It also helps one to relax, cope with stress, and promotes sound sleep. Exercise enhances psychological well-being, improves self-esteem, and maintains motivation. 7. Do not smoke. The best rule is never to start smoking because once the habit is established, giving up smoking is not easy. It can only be done if the smoker sets his mind to stop. 8. Drink alcoholic beverages in moderation. Moderate alcohol consumption means no more than one drink per day for women and no more than two drinks per day for men. One drink of alcoholic beverage means 1 bottle (12 ounces) beer or Â½ glass wine or 1 jigger (1 ounce) whiskey or 1 Â½ ounce of gin. 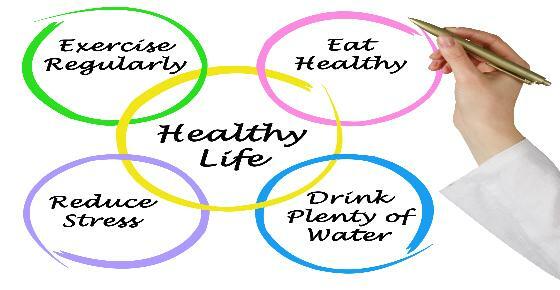 Let us all practice a healthy lifestyle to stay healthy and to live longer.